Paul Nicholson with the 15lb carp that helped him win the 2013 Vaughan Cup on the tidal Trent. The Tidal Trent at Laughterton, North Clifton and Besthorpe looked near perfect for this 71-peg match with a slight tinge of colour and running quite steady. There was a split tide but it was very small and only held the river still as it filled, which is not ideal. However there were some big fish caught including barbel to double figures and a 15lb plus carp, which secured things on its own for Neil Nicholson on peg 38 at Laughterton, as he weighed in 21-13-8. The next three all weighed in over 12lb, second placed James Dent having two barbel at Besthorpe, third placed Paul Moutrey latching onto some big hybrids at North Clifton and Eddie Bridon having a double figure barbel in his net, also at North Clifton. 1st Neil Nicholson (Browning Quaker) 38 Laughterton 21lb13.5oz 1 carp 15lb3oz plus skimmers groundbait feeder worm & caster. 2nd James Dent (MAP) 57 Besthorpe 13lb13oz 2 barbel groundbait feeder worm & caster. 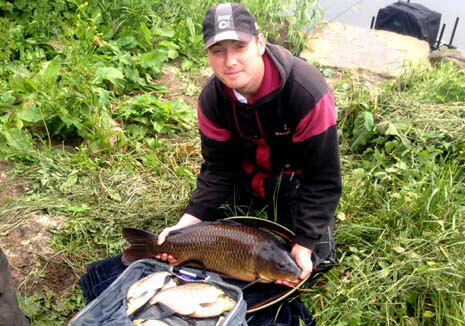 3rd Paul Moutrey (Scunthorpe) 23 North Clifton 13lb10oz 3 skimmers plus 8 big hybrids groundbait feeder worm & caster. 4th Eddie Bridon (Maver) 27 North Clifton 12lb1oz 1 double figure barbel plus bits groundbait feeder worm & caster.